It's strange to think that it's been ten years since "freak folk" came to prominence in the hearts of young indie music lovers. It's not a great name for this subgenre, I'll grant you that, but it sort of gives you a sense of where these musicians are coming from. They're not the slicked-up popsters who populate the iTunes singer-songwriter charts these days. They like Bob Dylan, sure, but they probably like his oft-maligned but wonderfully wackadoo Self Portrait more than your typical fan. They make music with acoustic instruments, but it's a little strange and kind of arty, you know? 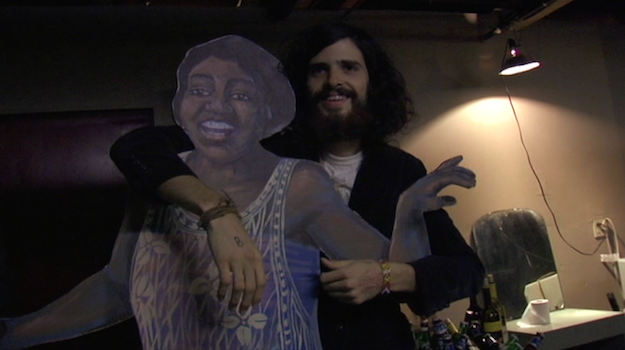 The verite-style documentary The Family Jams, shot in 2004 but not completed until 2010, documents a US tour featuring three leading lights of the San Francisco freak folk scene: Devendra Banhart, Joanna Newsom, and the band Vetiver. While all three of these acts are fully formed at the time of the tour, the film captures them at a moment when they have not blown up yet. Music blogs and entertainment magazines (remember those?) haven't gleefully slobbered all over them and made their sounds ubiquitous to plugged-in music fans. Only the early adopters have started coming to their shows; in big cities, the tour plays to decent-sized houses, but in the middle of the country, the musicians play in tiny bars and at DIY house shows. Fittingly, the document of this tour is low-key and often plays like a skillfully edited home movie. 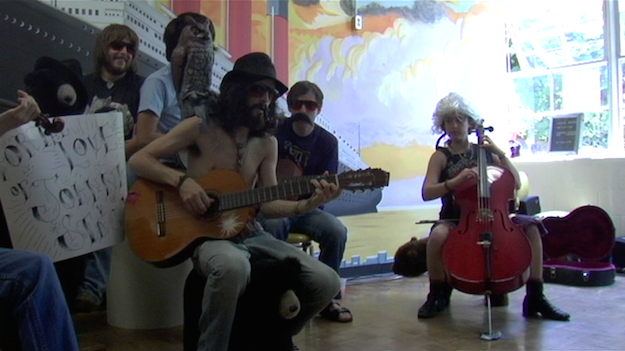 Shot and directed by Kevin Barker, who is friends with Banhart and plays music with Vetiver, The Family Jams shows musicians being musicians, goofing off, chatting with each other, and jamming. The title, in fact, refers to the finale of the shows on this tour, in which all the touring musicians get together and play. It's also, of course, the name of a '70s album put out by one of folk music's most infamous songwriters, Charles Manson. Indie music distributor Gary Held is shown talking about how some rock writer tried to make sense of the "Family Jams" allusion and thought that maybe Banhart saw himself as a charismatic cult leader. His listeners agree it's a stretch. Maybe not a big one though, honestly. The frequently shirtless Banhart is the star attraction for a reason. He has hippie Jesus good looks mixed with a thoughtfulness and vulnerability that make him intensely magnetic. Newsom's odd vocal delivery, elfin appearance, and harp-playing ability similarly allows her to command attention with little effort. Vetiver lead singer Andy Cabic just seems like a normal dude in comparison, which might be why he gets relatively less focus in the documentary. Or maybe it's because the main camera guy is also a dude in his band who can't really record video and play music at the same time. Director Barker doesn't strive to create an in-depth portrait of his subjects, but inevitably incidents occur which give us little windows into the lives of these performers. During their journey, Banhart hangs out with his stepfather, who helped foster his love of offbeat music, and later has an encounter with his biological father. This second relationship is clearly strained, and, in the lead up to meeting again, Banhart is shown acting apprehensive and irritable about the possibility of seeing this man at his show. When they do meet up, Barker doesn't get close enough for us to hear what they say, but it appears to be a surprisingly warm exchange. Newsom, meanwhile, ends up dealing with the loss of someone close to her due to a car accident and has to leave the tour to attend the funeral. When she returns, her touring car gets totalled in an accident of its own. In moments like these, the other musicians do seem like a family, offering support in times of emotional trial. As the tour progresses, the Family also ends up running into -- and often jamming with -- other musicians, including Antony from Antony and the Johnsons, The Pleased, Espers, and psych folk legend Linda Perhacs, who recorded her first album in 1970 and her second album just last year. As someone who only knew the artists in this film by reputation and a few scattered songs I've heard over the years, I found The Family Jams utterly engrossing. The film neither mythologizes its subjects nor gets lost gazing too much at their navels. It's just a sweet, honest portrait of some offbeat working musicians right on the cusp of becoming a pretty big deal. The DVD company Factory 25 has put out a bunch of DVD releases that incorporate different related media like 7" records and full LPs. 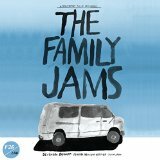 In that same spirit, The Family Jams actually comes packaged in a 52-page B&W book that features photos taken on tour, recent comments from the performers, transcribed snippets of dialogue from the film, and more. Glancing at the book before I watched the movie, I basically shrugged at it, but after watching the film and returning to the book, I found it to be a tremendously valuable compliment to the viewing experience. The film was shot mostly on a prosumer miniDV camera, and considering that, the widescreen 1.78:1 image looks pretty good. Some dark shots are pretty noisy from boosted gain, but otherwise the colors and blacks are pretty stable. Based on a photo in the book, it looks like all the audio was just recorded from a small shotgun mic mounted to the camera. And again, considering that, the Dolby 2.0 audio sounds pretty good. This recording approach does mean that some of the music scenes are little muffled, because they were recorded in the room and not off of the sound board, but it's never egregiously distorted. The only special feature is a chunk of deleted footage called More Tour (31:56) that focuses on full performances from all three touring acts. It's actually a really wonderful bonus, since the film usually doesn't stop to capture full songs and the sound on these clips is mostly outstanding. The Family Jams is a wonderful fly-on-the-wall documentary that will appeal both to fans of Devendra Banhart, Joanna Newsom, and Vetiver and more generally to fans of acoustic music. It's a humble but intelligently made film that illustrates the kind of loving community that can spring up around playing songs. Highly Recommended.